Living Area: 4534 sq. ft. Terrific home with commanding mountain views adjacent to #1 green on Robert Trent Jones Championship Golf Course. 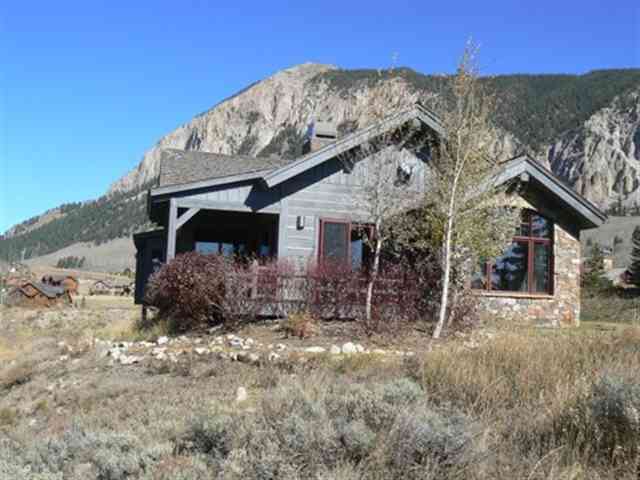 Easy access from the highway and to the Club at Crested Butte. Great room features two sided Tuilkivi soapstone fireplace and post and beam vaulted ceilings. First floor master with gas fireplace, expansive bath and walk in closet with deluxe built in cabinets. Kitchen features custom cherry cabinets, granite counters, walk in pantry, breakfast sun room, and stainless appliances. Lower level features three bedrooms with walk outs to deck, two with baths. Custom built in bookcase in one for possible office use. Family room features custom cabinets for books, games and media. Big closets and tons of store room round out this great family and vacation home.